I was planning to put in a vote for Hans Hofmann, one of our great post-WW II painters, one who gets better with each passing decade since his death in 1966. He had his first solo show here in 1944 when he was 64 years old. He blossomed in the 1950s, which was after his 70th birthday. Another friend, George Wingate, sent me the link to an article that appeared in a recent issue of the New York Review of Books, about the extraordinary Hedda Sterne. The Last Irascible by Sarah Boxer is a thoughtful—and inspiring—view into another artist whose output deepened over a lifetime. In Sterne’s case, her visibility never achieved anything close to the infamy of many of her male colleagues. So now, in addition to exploring and uncovering those artists who continue to produce great work, there is yet another vector to consider—gender. It is Hedda you see at the top in the legendary Life magazine photo above. 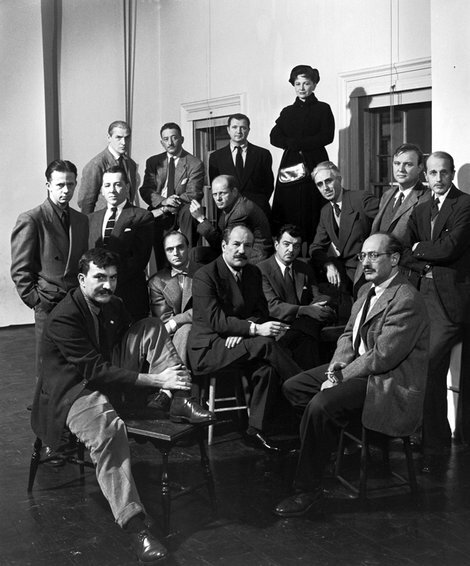 A Romanian exile who was married to the cartoonist/illustrator Saul Steinberg for many years, Sterne is the only one in the photo who is still alive. While she had a long and committed career as an artist, showing with the Surrealists as well as later artists, she does not seem to have been seduced by the ego and self promotion kool-aid that ended up being toxic for many of the Irascibles photographed above. What really distinguishes her is her refusal to develop what she tartly termed a “logo” style. 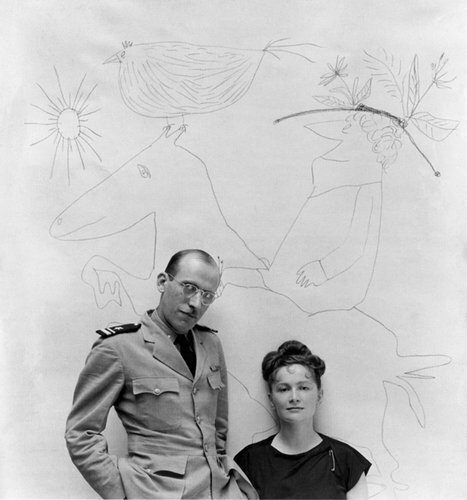 And that refusal, Sterne said once, “very much destroyed my ‘career.’” Although Peggy Guggenheim and Betty Parsons championed her, although major museums acquired her work, although Clement Greenberg praised her “nice flatness” and “delicacy” and Hilton Kramer mentioned her “first-class graphic gift,” and although she has had one of the longest exhibition histories of any living artist (seventy years), she is hardly well known. That doesn’t bother her. “I don’t know why, I never was burdened with a tremendous competition and ambition of any kind…. There is this wonderful passage in Conrad’s Secret Agent,” she noted. “There is a retarded young boy who sweeps with a concentration as if he were playing. That was how I always worked. The activity absorbed me sufficiently…” What came through was an artist who, in contrast to almost everyone else in the “Irascibles” photograph, had effectively erased herself. Not only was she not an Abstract Expressionist; she was the anti–Abstract Expressionist, someone who had no use for the cult of personality and personal gesture… And at a time when just about every painter who mattered was a heroic abstract artist, or trying to be, she was not. Sterne’s response could be viewed as detached, but I read it as evidence that she was wired most primally to her own inner deep core. And regardless of this change in her living circumstances, she simply moves to a more reclusive life and continues to work. I want to be able to say that too, right up until the last day of my life. Hedda Sterne lived without ego in personal and professional aspects of her life. How else can she divorce as friends and refuse a “logo” style, that keeps her from fame. In surrendering her ego, becoming fearless and anger free, she has removed the boundaries of the finite. Walking in the house like a lion everyday, drawing and learning sounds like a fierce way to live, no matter your age. Di, she is a remarkable example of a way of living that inspires me personally. I was amazed by this article because I only really knew her work, not her personal history. I’m fascinated and want to learn more about her. Thanks for your insights.